An Italian American, yes you read right, that’s the Jeep Renegade. I mixing pot of culture and passion from Jeep and Fiat, being that the Renegade is built in Italy with guts from Fiat 500X. Now I know you are probably thinking this might not be a good idea. Looking at certain collaborations from other vehicle manufacturers in the past, but this is definitely the exception to the rule. The Crossover segment of the market is hot property at the moment, with many new models hitting the ranks in recent months. To stand out in the crowd is not an easy task, and Jeep has managed to make it look easy. How did they do this you may ask? … Pure passion. So what makes this Renegade a cut above the rest? Turning the steering wheel gives you a great, positive response. Giving you the go, is the 1.4 turbo petrol engine from Fiat, delivering more than enough needed power. Yes, I said it, a 1.4 turbo giving enough power. Most of the test drives I have done in recent months has been big power hatches and sedans, and driving the Renegade does not have me wishing for any more power. What this car delivers is perfect for the daily commute, weekends away and puts a massive smile on your face. The version I drove was the 6 speed manual, and what a great gearbox! The gearstick is a little long, but Jeep has made it work well by giving it a short sporty throw paired with a very well defined gear engagement between shifting. Something that had me smiling from ear to ear was the little turbo chirp from the engine between the RPM changes. It made me feel like I was driving something with a lot more power than what the brochure dictates. The more I drove the Renegade, the more I began to “get it”, and the bigger the grin. Fiat knows how to make great handling cars with engines and gearboxes to compliment, and this DNA runs strong in the Renegade without a doubt, great move Jeep! The most striking aspect of the Renegade is the look. It is not your average run of mill sharp nose, futuristic cat eyed Crossover. In fact what Jeep has done is given the Renegade a utilitarian all business look, based on its Willis Jeep heritage and cue’s in design from extreme sports equipment. I just love it when a manufacturer uses it’s very own heritage to style a new car, this means that what you get is the heart and soul of what makes that brand who it is. Jeep has taken this to the full extent. The front grill is unmistakably Jeep, with echoes from its great grandfather, the Willis. More of the hints are found in the very eye catching rear light design that not only has the Willis Jeep logo in the centre of the lens, but the overall shape is meant to look just like the Jerry fuel cans from the old Jeep. This nod to all that is Jeep continues throughout the vehicle, and is, as Jeep calls it, an Easter egg hunt of sorts. Do yourself a favour and go see if you can find all of them. One of the most noticeable fun loving elements is when you get behind the steering wheel. Usually where you see a RPM reline marked with a few thick stripes to indicate where NOT to rev the engine, you find a paintball splatter, because paintball was the designers favourite past time, so they decided to include it. 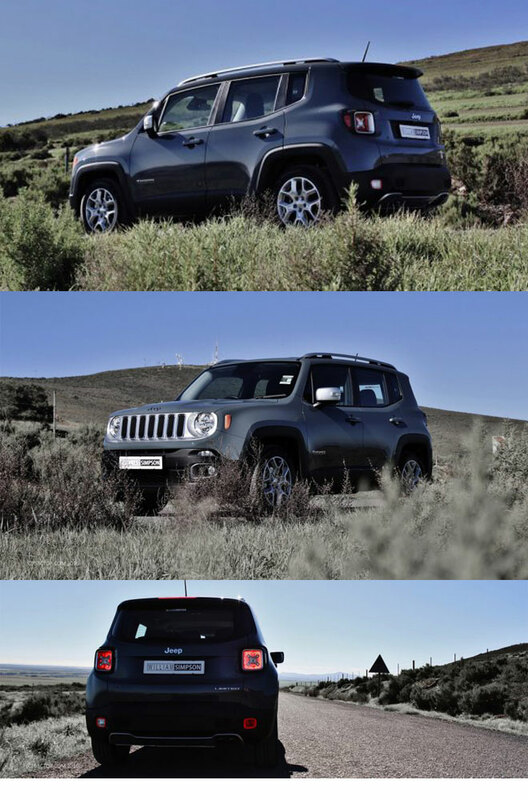 Just another reason to show you how much character this Renegade really has. Now I know you think that with all this masculine influence it will only appeal to guys who wanted a good dual purpose vehicle, but that is far from the truth. While stopping at gas stations and listening to people look and point at the Renegade, the appeal seems far reached beyond any definition and will turn anyone a true fan of this unique machine. 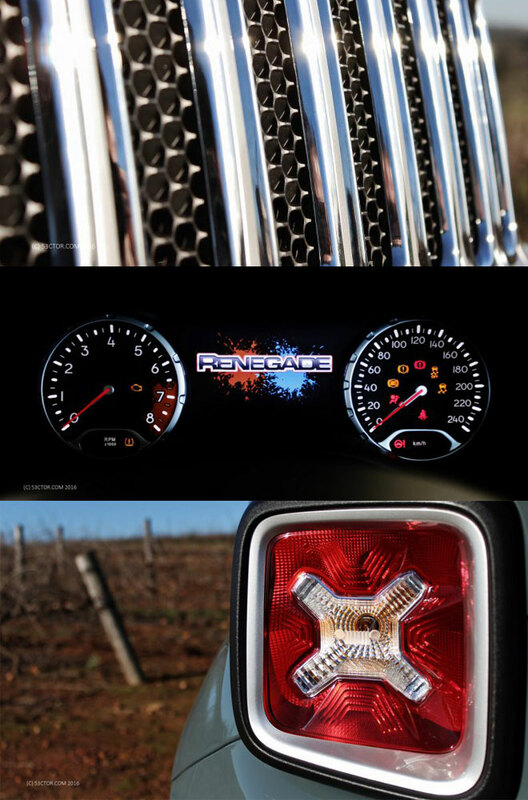 The quality and spirit of the Renegade extends into the interior as would be expected. There is a great tactile feel, adjustment knobs and buttons have a great committed click and a chunky steering wheel with good solid feel rounds everything off perfectly. The front grab rail in the dashboard feels as if it is bolted straight to the chassis. On the Limited model I had on test, is was treated to very comfortable leather seats to give that added premium feel. When it comes to the Tech, it has it all. Dual climate control, MP3/ Bluetooth touchscreen, reverse camera, park distance sensors, lane change assist, cruise control, electronic seat lumbar support and the list goes on! With such a spec sheet one can easily be forgiven in thinking that this could be the details of some or other luxury German sedan. Something all cars should have, no matter the type, should at least be a good sound system, and Jeep has done well in supplying a full, clear sounding system in the Renegade. As mentioned earlier, Jeep has created a Little Easter egg hunt of sorts. Little clue’s all over showcasing its fun loving nature. An old Willis Jeep picture climbing up the side of the windscreen, a little spider inside the fuel filler cap saying “Ciao baby”, all renouncing the passion in this project. A feature I think everyone will find particularly useful, and one that caught me totally by surprise was the blind spot alert. If you have your indicator on and try changing lanes with a car in or approaching your blind spot, a light illuminates in the side mirror and an audible beep goes off to warn you. Now while this might sound quite uneventful, it can prevent a good day turning real bad. I cannot believe this vehicle has managed to slip under my radar for so long. It is a real hidden gem. My perception of this segment has been totally rocked by the Renegade, and I can only hope that more people make the effort to go and drive this vehicle. If you want to stand out in the crowd and have fun while doing it, then this Jeep is the adventure you have been waiting for. Special thanks to the Jared Eksteen and the guys over at William Simpson Cars for supplying us this great machine to test. Want the best deal in town on this beaut, go have a chat to them.